At the beginning of the 1970s, the Japan Agency for Marine Earth Science and Technology was commissioned by the Science and Technology Policy Bureau to conceptualize and conduct test construction of a "Seatopia Plan" that would allow people to live in dwellings 300 meters under the sea. Our divers were selected to take part in this plan, and in 1978 this effort led to our participation in the research, development, and construction of a subsea oil production system. Fukada Salvage & Marine Works began to represent the consortium that was involved in the endeavor, and assisted/led comprehensive testing in the waters of the Seto Inland Sea. Later, in 1997 we offered comprehensive assistance in tests to collect nodules of manganese (a prized rare metal) from the ocean floor. We successfully collected seven tons of manganese nodules from the ocean floor at a depth of 2,200m, and with this, we became involved in various ocean resource and deep sea test construction. As a pioneer in this field, we have accumulated much technological prowess and experience. Unfortunately, for the past few decades Japan has depended heavily on imported energy resources, and development activities by Japan to develop and produce underwater resources has been stagnant. However, Japan is taking another look at this in light of recent energy problems, and the field has been booming. It goes without saying that technological innovations and commercialization in this field will have a major impact on Japan's future. Fukada Salvage & Marine Works will use its accumulated experience and success to upgrade its equipment and contribute to the advancement of marine development for our future. 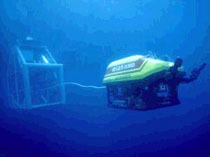 We have been operating the Hakuyo 2000 ROV (Remotely Operated Vehicle), which can dive to 2,000m, as well as the manned submersible Hakuyo (diving depth of 300m), in a variety of marine survey and salvage work. We recently added a new Hakuyo 3000 (ROW with a diving depth of 3,000m) and an AUV (Autonomous Underwater Vehicle) to our fleet to be ready for future developments in the ocean development field.